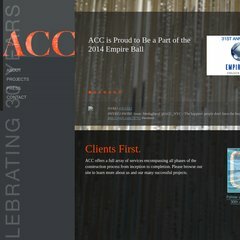 Topics: Acc Construction, and Projects. Its IP Number is 64.71.33.111. Its 4 DNS Records include, dns034.a.register.com, dns196.b.register.com, and dns010.d.register.com. It is hosted by Affinity Internet Inc Florida, using Apache web server. PING www. (64.71.33.111) 56(84) bytes of data. A time of 14.0 ms, is recorded in a ping test.